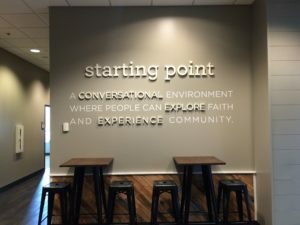 Dimensional lettering is one of the most effective signage options that an architect can use in a commercial facility. Dimensional lettering offers an affordable and sleek alternative to slapping vinyl on a wall, that exudes permanence, class, and strength. 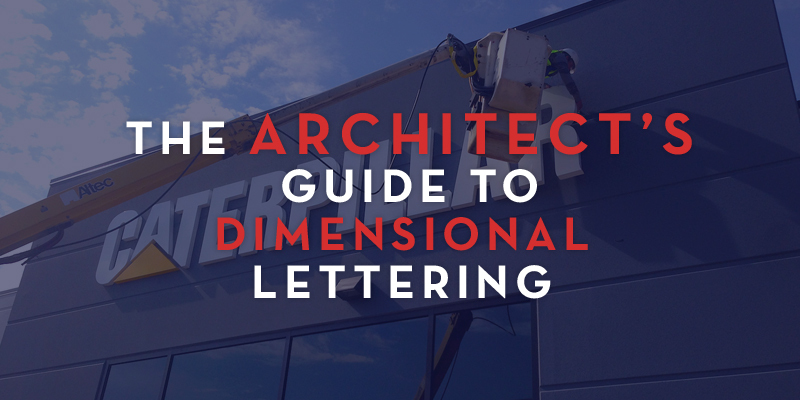 This post will walk you through the different kinds of dimensional lettering, and how they can be incorporated into a building project successfully. In the midst of all the moving pieces that come with designing a commercial building, signage can often become an afterthought. But without the right signage, even the most well designed building can look cheap, and hurt a company’s overall brand. While changes can be made after the fact, signage should be fully planned out before a contractor begins the building process so that the signage can be an extension of the building itself. Choosing the right material for your design has to do with your brand, where the dimensional letters will go, and your budget. It’s incredibly important to follow all brand guidelines when designing dimensional letters. The class, and strength of dimensional letters will be ineffective if they are used in ways that are inconsistent with your brand. If your brand colors match a raw material like aluminum, unpainted metal can be an extremely sleek option for commercial signage. But, if your brand requires certain colors that can’t be achieved by any available raw materials, most materials can be painted to match any brand logo. Where will your dimensional letters be located, and where will their audience be located? If your sign is outdoors, it’s important that you choose a material that will be able to withstand the elements long enough to make it a worthwhile investment. Will your lettering be exposed to natural light? Whether they are out doors, or near a window, this can help with visibility, and save you money on lighting. But keep in mind, highly reflective materials like metals and gloss acrylic can create a blinding glare if they catch the sun at the right angle. If your letters are not exposed to natural light, or if they need to be seen outdoors at night, then you will need to consider front or backlighting options. Also, you’ll need to take into account how far you want the letters to be visible. Here is a chart showing the relationship between letter size and visibility. In general, metals will be more expensive than plastic, acrylic, or foam, but aluminum offers a cost effective and durable metal option. It’s important that you begin designing your dimensional letters with plenty of time before they need to be installed. The larger the project, the more time it will take to complete. While you may have a capable in-house design team, a custom sign company will have designers that know the limitations and strengths of dimensional lettering and will be able to design accordingly. A high level sign company will walk you through different pricing options, help you design your dimensional lettering with your brand in mind, handle communication and ordering from the manufacturer, and have the resources to install the lettering correctly and on time. 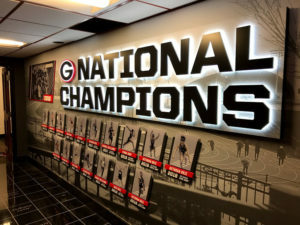 Pros: Excellent value, and letters can be custom painted to match your existing interior decor, providing a high-level look to your brand without a big hit to the project’s budget. Cons: Interior use only. Prone to scratches & nicks more than other dimensional letters. Pros: Durable letters hold up in exterior environments. Maximum legibility for a minimum budget. Cons: The aesthetics of formed plastic letters scream “branding on a budget.” Most often the letters have a glossy, plastic look that isn’t ideal for high-quality representation. Additionally, manufacturing limitations won’t allow for crisp, sharp corners needed on smaller letters. Pros: Produced with clean edges & tight corners, this style offers a high quality & durable option for both interior & exterior applications. Even small details don’t get lost in the manufacturing process. Cons: Although they are more durable than PVC letters, they are still subject to breakage on occasion. Pros: This product gives your letters a metal face/finish without the expense of a thick metal letter. Laminates are common in the industry, as they’re the most effective way to balance material thickness, finish, and affordability. Cons: This is meant for interior displays only. And if your clientele will be viewing your lettering at a close proximity, they will be able to see that your aluminum laminate letters aren’t bona fide. Pros: Aluminum, Brass, Bronze, Corten Steel, and more. There are lots of options to match a metal to your message. Metal letters impute quality into your branding when used with an effective design. Laser-cutting manufacturing gives your lettering the professional-grade detail that matches the quality of the product. Cons: Depending on the type & thickness of the metal letter, the price can increase substantially. Also, metal letters are heavy & must be installed with care by a sign professional. Pros: This product is the high-end option when your branding requires details AND illumination. LED lighting imbedded into the acrylic letters can be front-lit, back-lit, or a combination of both. Highly customizable to match your brand. Cons: Installation requires electric service, although letters operate using low-voltage LED modules. When service is required on LED modules (after 30,000+ hours), often a new letter is required, as individual modules cannot be serviced. Pros: Channel letters are a very effective way to light up your logo or message. Most of the illuminated signage you see on businesses’ exterior walls are channel letters. Easy to service & maintain. Very versatile design options available. Cons: Production limitations can limit how small we can make these letters. For illuminated letters, we must have a channel at least 1.5in thick for LED modules & wiring purposes. Dimensional letters are a higher end product, and thus can be more difficult to install than a typical vinyl sign. They can be mounted on smooth surfaces with double sided tape, or studs for more textured surfaces. It will take a specific knowledge of surfaces and material weights to decide the best way to mount dimensional letters. An installer will also need to have a template and measuring tape for arranging the letters with the proper spacing and alignment. If the installation site can’t be reached from the ground it will require the use of a ladder or a lift. Even a fall from less than ten feet can cause serious personal injury and be a serious liability for your company. For these reasons, we recommend outsourcing installation to a sign company that is experienced in installation. 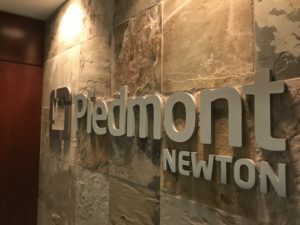 If you are interested in incorporating dimensional letters in your next commercial space, don’t hesitate to reach out with any questions you might have.